A reporter claiming to work for Al Jazeera was involved in a violent confrontation with Washington, D.C., police on Tuesday evening after he was ejected from a pro-Israel conference for surreptitiously videotaping attendees and events, according to eyewitnesses. Reporters identified as Matthew Cassel and Micah Garen were ejected from the Christians United for Israel’s (CUFI) annual D.C. gathering after they were caught infiltrating and clandestinely filming events closed to the press. The reporters, who claimed to be affiliated with Al Jazeera, were initially denied press credentials for the event due to what a CUFI official said is Al Jazeera’s anti-Israel bias. The pair only gained access after purchasing general admission tickets at full price. Cassel is a photojournalist with Al Jazeera English. Garen is a cofounder of Four Corners Media. Another Four Corners Media cofounder, Marie-Helene Carleton, had initially applied for television credentials as an Al Jazeera English employee. 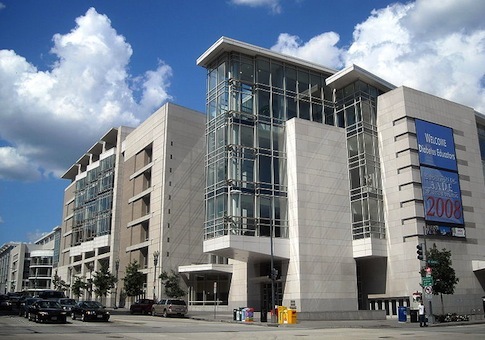 Once CUFI officials confronted Cassel and Garen about their activities, both were ejected from the Washington Convention Center, where the four-day event was held. Cassel left the conference with no issue. However, Garen argued with officers outside of the convention center after they confiscated his video equipment, sources said. 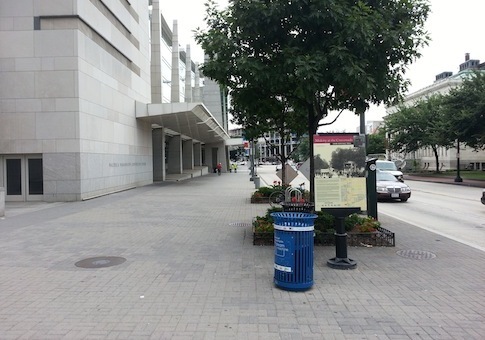 "As I approached the convention center, walking south on 9th street, I saw what at first I thought was someone having a psychotic episode," said one conference attendee who witnessed the incident. "There were four D.C. police officers trying to restrain and subdue a man who was violently trying to break free," the attendee said. "I thought the cops were going to taze him—they certainly would have been justified." "At one point he broke partially free and lunged at a blue trash can but was dragged off of it," the source continued. "Eventually the police restrained him and escorted him away. I don't know why he thought he was going to win in a fight against four cops. It never works out that way." A CUFI spokesman declined to comment about the situation. A Metropolitan Police Department spokesperson could not provide information about the incident. A source inside CUFI told the Washington Free Beacon that both Cassel and Garen claimed to be affiliated with Al Jazeera English even though they had not been issued official credentials to the event. CUFI had denied credentials Al Jazeera America and Al Jazeera English due to the recent publication of an anti-Semitic screed by Columbia University professor Joseph Massad, the CUFI source said. "Upon discovering there were journalists reporting on the confab surreptitiously and without media credentials, [Cassel] was confronted," the source said. Cassel acknowledged that "he was with Al Jazeera English and was ejected from the summit without further incident," the source said. However, "upon learning that he had a companion, [Garen] was similarly confronted by police officers and security," according to the source. "He was eventually ejected from the building as well," but only after first denying that he was affiliated with Al Jazeera. Al Jazeera English did not respond to a request for comment submitted via its online press office. Al Jazeera America, which also applied for credentials, did not respond to a request for comment. Once Garen was outside of the convention center, police officers and security personnel asked that Garen hand over his recording equipment, according to the source. That is when Garen threw his video memory card into a nearby garbage can, prompting officers to retrieve it, the source said. At that point, Garen is said to have lunged towards the garbage can to intercept the item, sparking a violent skirmish with multiple officers, the source said. "The Washington, D.C., police officers exhibited the utmost professionalism at all times," said the CUFI insider. A source who later obtained Garen’s video card shared it with a Free Beacon reporter. Included on the card are several videos of CUFI members, as well as U.S. and Israeli military personnel, being secretly recorded as they walk to various events and engage in conversations. The cameraman appears to be hiding the recording device beneath a jacket in another video as a private CUFI strategy meeting takes place. Multiple signs barring videography had been posted throughout the conference. Cassel can be seen in another video speaking on his cellphone about being kicked out of the conference. "I’m here just for a day," Cassel says. "I just, I just got kicked out of the Christians United for Israel." "But you got leaders of the Jewish community and everything hanging out there, Israeli leaders," he says. Al Jazeera’s behavior is flatly inappropriate for an outlet that claims to be a legitimate news source, according to the CUFI source. "These duplicitous tactics contradict the assertion that Al Jazeera is a legitimate news organization," the source said. "If Al Jazeera wishes to be taken seriously as a media outlet, they would be wise to do a better job of training their staff on how to behave like professional reporters, rather than college activists." CUFI also declined to provide a press credential to an individual "from the far right who has said terrible things related to the president," according to the source. Neither Cassel nor Carleton returned requests for comment about the incident. This entry was posted in Issues and tagged Al Jazeera, Media. Bookmark the permalink.